In some instances, dogs are not only valuable family members, but life-saving aides. Working dogs can be found in military and law enforcement agencies worldwide, but also in hospitals, schools and citizens’ homes as service and therapy dogs. There are several important differences between service dogs, therapy dogs, and emotional support dogs, but all have important jobs that save lives. Let’s take a moment to not only appreciate these very special animals, but to familiarize yourself with service dog challenges, etiquette and more. According to service dog education group Please Don’t Pet Me, “Differentiating between service dogs, therapy dogs and emotional support animals is not a matter of splitting hairs or political correctness. Each of these dogs has a very different job from the others and the terms are not interchangeable.” Many service dogs take on different tasks from a legally recognized service dog to an emotional support animal, however there is a distinct difference: Service dogs assist people with challenges such as hearing or visual impairment, autism, seizures and epilepsy, diabetes, and more. They can be trained to perform an array of tasks including leading their human across busy streets, retrieving objects, opening and closing doors and even getting help. They usually wear a service dog vest, but not always! Each disability requires a unique kind of service dog; the blind have very different assistance needs than those with epilepsy, or those with emotional needs, and so on. 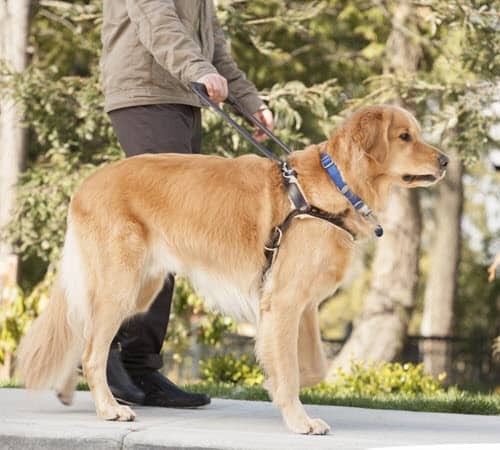 Mobility assistance dogs are used by those with mobility restrictions or in wheelchairs; diabetic alert dogs are trained to recognize low insulin levels just through their sense of smell. Certain types of service dogs work with those who have autism and PTSD to help reduce anxiety, depression and improve social development. The health benefits of dogs are pretty amazing! A service animal must have specific training that fits its handler’s disability. Everything from medical alerts to coping mechanisms are trained, and many handlers will train their own service animals. Many volunteers start training the dogs as puppies and place them in volunteer homes to socialize and acclimate the pups to sights, sounds, smells and distractions. The pup is then professionally trained in obedience, retrieval, and handling. The cost for training a service dog can run anywhere from $15,000 to $50,000. It can be deducted from taxes, and there are a few other ways to defray costs. Guess what – it’s a myth that a service dog is required to wear a vest or other identifying garb! While many handlers have their dogs wear vests in order to keep the public from petting and to enter businesses without a hassle, it is not required. If you see a service dog, whether they are wearing vests, backpacks or harnesses, or you spot a working dog, simply ignore the dog. Do not whistle, pet, or interact with a dog on the job. And if you don’t know if the dog is in service, err on the side of caution and simply move along. It can be a dangerous distraction for service dogs and their humans. Want to donate or volunteer? Look for a local organization that needs help – they could have an Amazon Smile account or even an Amazon wish list, or perhaps they need dedicated families to help raise some pups. FCVC welcomes the opportunity to talk to you about the health of your pet and the roles they may play in your life.